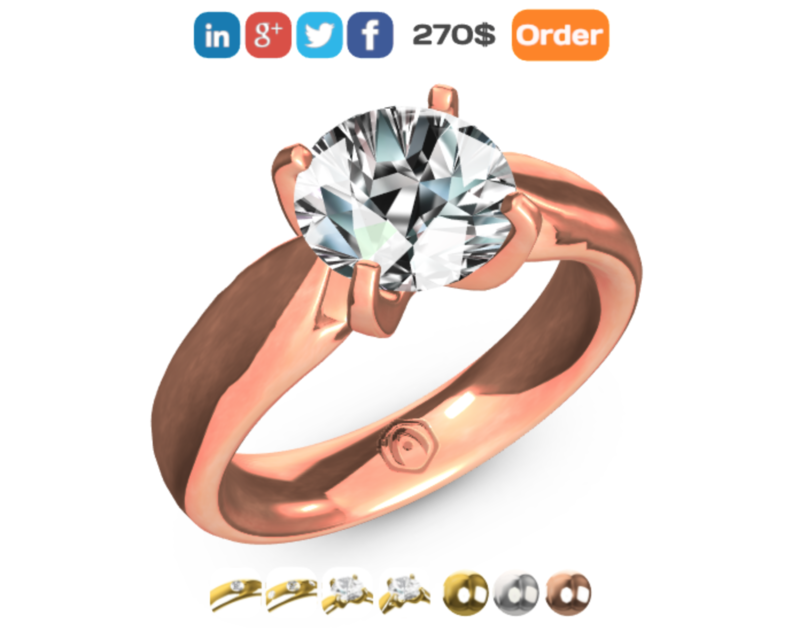 In our previous article Do-it-yourself 3D product configurator, we discussed creating a basic jewelry customizer app using the Verge3D framework combined with Blender or 3ds Max modeling suites. Calculating the price based on the user’s configuration. Submitting orders for further processing by a sales manager. As usual, you can find the source files (3ds Max, Blender, and Puzzles) of this configurator, as well as the WordPress plugin itself, in the latest Verge3D distribution. First, we need to set up a server for your e-commerce app. Then we create Puzzles logic to calculate and display the total price as well as logic for sending orders. Finally, we add LinkedIn, Google+, Twitter and Facebook sharing options to your app. Let’s review this production process step-by-step. In this tutorial, we assume that you have the WordPress content management system installed on your server. Since version 2.7, Verge3D comes with a plug-in for WordPress making 3D content easily accessible to more than 60+ million websites around the globe. This plug-in offers a nice feature which will be very handy in our project – a simple e-commerce system for processing customer orders which in turn can be submitted using the “place order” puzzle (we’re going to discuss this puzzle a bit later). If you don’t have a server or you don’t know what WordPress is don’t panic! Simply Google “WordPress hosting” and order a ready-to-use installation of this system for several bucks per month. To start working with it you don’t have to be a programmer or an experienced web designer at all! Let’s continue with our server installation. 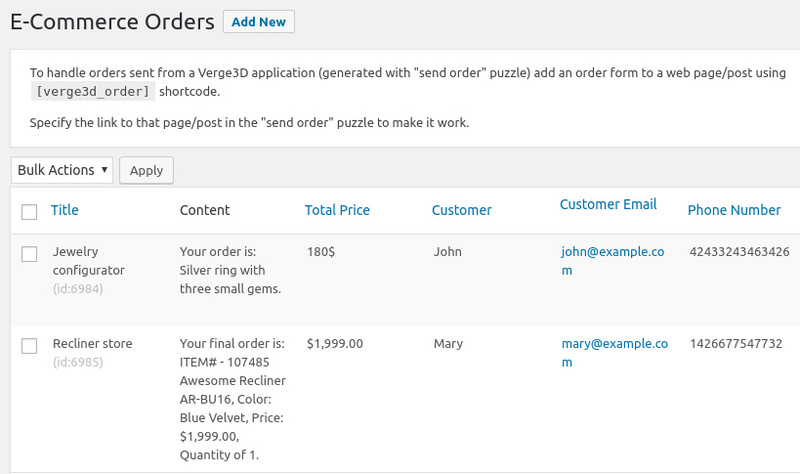 First, install and activate the Verge3D plugin via the “Plugins” menu in WordPress admin interface. You can find this plug-in in the official WordPress.org repository. The orders in this list are created automatically upon receiving requests from your configurator app. You can use this screen for reviewing and managing customer orders. For example, when John orders a silver ring with three small gems for $180 you can call him or send an email to confirm his order and find out any additional information, such as a delivery address or payment method. That’s all that you need to do with the server! Now it’s time to turn back to our configurator and make it work with WordPress. 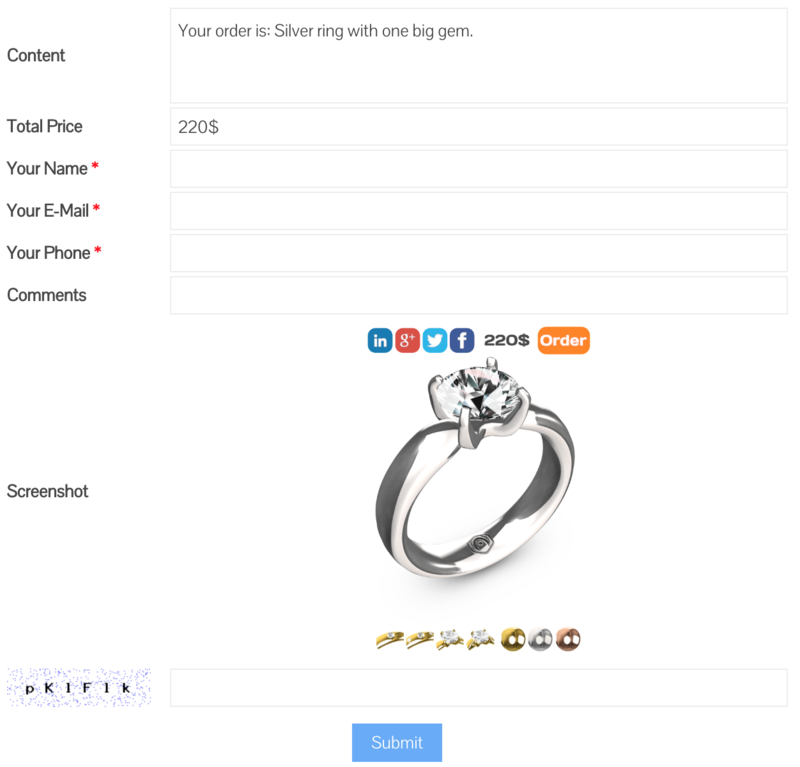 The logic is uncomplicated at all: when the user clicks on the order button we calculate the price of the ring based on the selected metal and gems. Then we use the “place order” puzzle to sent the actual order to the server. Pretty easy, right? When the user clicks on the social button we just open a new browser tab with the information we want to share: title and description. The techniques described in this article can be used not only for product configurators but for other e-commerce applications as well. For example, you can use it to create a 3D models store or some interactive presentation of your skills if you’re a studio or freelancer. Basically, it will be useful for every application where you need to “order” something. In regards to social media, the possible applications are basically unlimited. Use your imagination to assign social sharing capabilities to any 3D objects, not just buttons. Thanks for reading this, feel free to share your thoughts below in the comments! but i am 3D artist ,we dont have any web design experience,so i want google web designer tutorial ,like this product configurator . thank you for your reply! Verge3D is fully compatible with Google Web Designer and we have plans to create a tutorial on how to use this tool to create 3D configurators. Stay tuned!